SHENZHEN, China, Jan. 23, 2019 /PRNewswire/ -- Modular building provider CIMC Modular Building Systems Holding Co Ltd (CIMC MBS) announced that six new blocks of student accommodation at Newcastle University, consisting of containerized modules, has officially come into service last month. 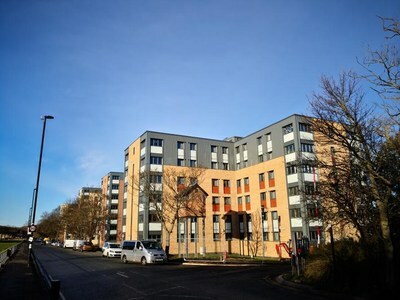 The Park View Student Village, as the student accommodation is called, is believed to be the country's largest of its kind. Modular construction, considered as an environmentally friendly and time-saving alternative to traditional construction model, provided by Chinese companies is seeing growing application. This method of construction is a type of prefabricated building model. Instead of doing all the construction work on-site, it allows more than 90 percent of a building project to be finished in the factory, thereby reducing construction time and construction waste by over 50 percent. According to the Shenzhen, Guangdong province-based company, the project consists of 789 modules, with a total area of 37,000 square meters. It includes 1,261 standard rooms, 9 rooms for disabled people and 162 kitchens. With an investment of £75 million ($97 million), it is the university's largest investment project. "It would have taken three years minimum using traditional techniques. But using the modular services provided by CIMC MBS, the construction company was on site for a total of 110 weeks, a significant reduction in the construction period," said Paul Milburn, project manager of Galliford Try, general contractor of the project. The British project follows another one in the United States several months ago, when the company delivered modularized student accommodation to the University of California, Berkeley. According to a report by market research firm MarketsandMarkets, modular construction market stood at $106.2 billion in 2017 and is projected to reach $157.2 billion by 2023, representing an average annual growth of 6.9 percent over the period. Asia Pacific dominated the market in 2017 in terms of value, with China contributing a major share of it, the report said. "Access to high quality accommodation is an important part of student life and a significant factor in defining students," said Chris Day, vice-chancellor and president of the university. "I'm pleased to say that our students already consistently rate the standard of their accommodation very highly, and I feel sure that with the addition of Park View Student Village to our portfolio, our standing can only improve." Victor Zhu, general manager of CIMC MBS, said modular buildings have won high praise not only due to the economic efficiency and comfort, but also the sustainability. More modules can be added to the current architecture to meet the increasing accommodation demand from students.